"A gift for follower of design & fashion"
Are you happy with someone who loves shopping and what they wear - then give them this amazing cat who is adored by Karl Lagerfeld. Steiff has designed the fabulous CHOUPETTE cat who is owned and loved by the famous world wide fashion designer - KARL LAGERFELD. 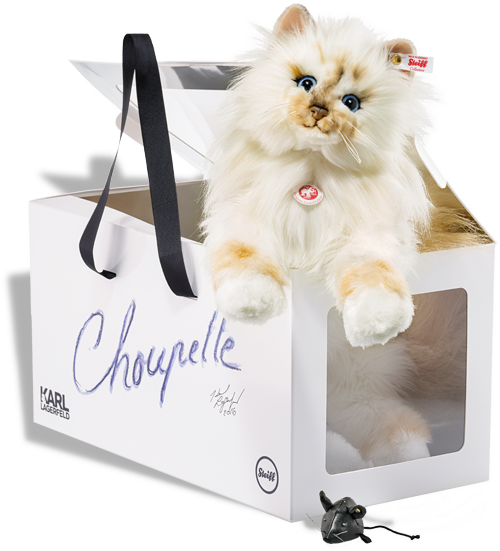 CHOUPETTE is the cat that stole the heart of world fashion icon Karl Lagerfeld and is his constant companion. Beloved CHOUPETTE is a from the breed of Birman cats and from a young age CHOUPETTE met Karl Lagerfeld - It was love at first sight! Karl Lagerfeld calls her his 'Garbo of cats' and they never leave each other - he takes her everywhere, pampers her and adores her big sparkling blue eyes and hand applied whiskers. CHOUPETTE'S ears are lined with utrasuede and her paw pads are embroidered. Steiff bear decided to give CHOUPETTE her own toy and so a handmade leather mouse completes her together with her own Steiff button in the ear. Just look at her magnificent face and you can see how the artisans in Steiff have hand airbrushed with shades of brown around her face and paw pads................and she has a long exquisite tail. Here is a way to buy a very special Steiff bear piece linked to such a renown designer who is loved throughout the world. She arrives packaged in a special box that also serves as a carrying case.